Question - What do you mean by competitive strategy? 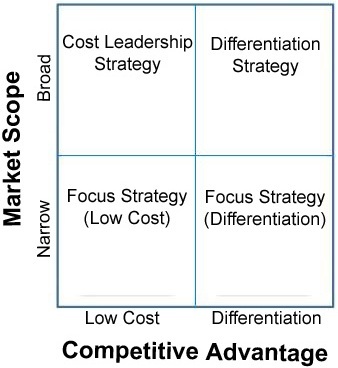 Explain Porter's Generic Strategies Model to define Competitive Strategy. Well said by Will Durant - "The future never just happened. It was created". A business organization has to define its competitive strategy to guide and focus its future decisions, and to gain sustainable competitive advantage over its rivals to make the organization successful in long run. Organizational results are the consequences of the decisions made by its leaders. 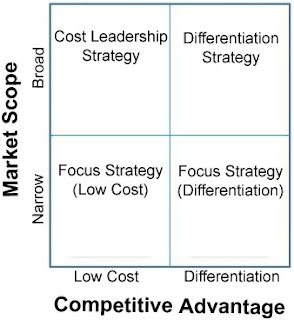 The framework that guides and focuses competitive positioning decisions is called competitive strategy. The purpose of competitive strategy is to gain sustainable competitive advantage over the rivals. Competitive strategies are essential to organizations competing in markets that are heavily saturated with alternatives for consumers. To be successful in such type of market it is necessary for an organization to define its winning proposition in simple and compelling way. According to Porter ME, 1980 competitive strategy can be defined as the "plan for how a firm will compete, formulated after evaluating how its strengths and weaknesses compare to those of its competitors. For example, a small meatpacking firm may decide to concentrate on a special niche product offered in limited areas after determining it cannot compete on price with major competitors." Competitive Strategy can be defined as a "framework for making decisions which priorities actions that create results in a competitive market." Competitive strategy is a long term action plan that is devised by an organization to gain sustainable competitive advantage over its rivals. 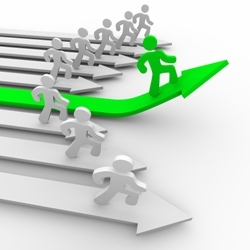 Competitive strategy consists of the actions which are taken to attract customers, to withstand the competitive pressures of the market and also to help and strengthen the firm's market position. The main objective of the competitive strategy is to gain a competitive advantage over organization's rivals. The competitive advantage can be either greater customer value than the competitors or higher operational efficiency than the competitors, or both. Competitive advantage can be defines as a "superiority gained by an organization when it can provide the same value as its competitors but at a lower price, or can charge higher prices by providing greater value through differentiation." According to Salonar, Shepard, Podolny - "most forms of competitive advantage mean either that a firm can produce some service or product that its customers value than those produced by competitors or that it can produce its service or product at a lower cost than its competitors." John Kay (1993: 14) defines distinctive capabilities as ones derived from characteristics that others lack and which are also sustainable and appropriable. "A distinctive capability becomes a competitive advantage when it is applied in an industry or brought to a market." According to Michael Porter sustainable competitive advantage can be achieved through three ways - cost leadership, differentiation, and focus. These strategies are applied at business unit level. These strategies are called generic strategies because they are not dependent on specific firm or industry. This strategy calls for being a low cost producer in an industry for a given level of quality. This strategy usually targets broad markets. The producer can charge either equal to average industry price to earn a profit higher than that of competitors, or blow average industry price to gain market share. In the situation of price war, the firm can earn some profit, but the competitors have to suffer losses. When the industry matures and prices declines, the firm that produce more cheaply will remain profitable for longer time. The firm can reduce cost of production by improving processes efficiency, getting lower cost materials, vertical integration, optimal outsourcing, efficient distribution channels, expertise in manufacturing and engineering. This strategy calls for the development of product or service that offers unique attributes and that is perceived by customers different or of greater value than the products or services of the competitors. The unique attributes makes the product different from the competitors' products and adds value to it. This added value allows the producer to charge a premium price for its product. The unique attributes can be brought to the product through scientific research and development, creative and skilled product development team, proper communication of perceived strength of the product, innovated design and features. This strategy also targets broader market. The focus strategy targets a narrow market or segment and within that segment attempt to achieve either cost advantage or differentiation. As the entire focus of the firm is on a group or segment, so the needs of the segment can be serviced better, and firm often gain high degree of customer loyalty.